Crystals and Gemstones on Amazon. click here for the list of 53 stones and crystals for complete associations and correspondences. Crystals carry energy vibrations, and can subtly help to bring the energy vibrations within your body and aura into a healthy and vibrant balance. Quartz, in particular, is uniquely potent and useful- have you ever wondered why quartz crystals wind up in everything from inexpensive wristwatches, to the most advanced technology we possess? The electronics industry is based on the properties of silicon and quartz crytals; these amazing natural minerals organize and regulate electrical energy. Metaphysically, the quartz crystal can be “programmed” to help clear away negative energy from the aura and re-align the chakra energy centers of the body. Scroll down this page to browse the healing and metaphysical properties of more than 50 crystals and gemstones! Crystals are a tool and can be like a storage battery for thought energy. “Clearing” has to do with the energy of the stone or crystal. Crystals can be “programmed” with our thought energy and then act on our subtle energy fields. They also to help to create situations in our lives that will lead us in directions that allow positive growth and healing. Clearing a crystal or gem stone is a simple task, and it is a way to insure that there are no left over negative energies from the person who owned it before you. It is a way to personalize your crystal, and create a new energy bond between you and your new gem stone partner. There are many ways to do this, but this is a simple and effective way – make sure you will not be disturbed. Hold your new crystal under running water, and as the water pours over it, close your eyes and imagine all the negative energies are washed away down the drain and out to the vast ocean to be purified by the cycles of life. You can also leave them in the warm sun, and allow the power of it’s light purify to the crystal with “fire”. To program your new crystal, simply hold it in your hand, close your eyes, then in your imagination, create an image of what you want your crystal or gem stone to help you create. Keep your crystal close to your skin, and when you can not wear it, store it in a special box or bag, which has also been purified and blessed. Fill your crystal companions with love, and you will recieve it back threefold! Each chakra has a color, and different gem stones and crystals can be associated with these. The ROOT CHAKRA’S color is red, other colors associated with the Root Chakra are black brown, and gray. Gemstones like garnet onyx, and red jasper are beneficial. The NAVEL CHAKRA’S color is orange. Gemstones like carnelian and orange zincite help to bring the system into balance. The SOLAR PLEXUS CHAKRA’S color is yellow. Gemstones like citrine and yellow sapphire are used. The HEART CHAKRA’S color is green and the secondary color is pink. Gemstones like rose quartz or green tourmaline are useful. The THROAT CHAKRA’S color is blue like aqua or turquoise, secondary colors are various shades of lighter blues. Gemstones like turquoise or blue lace agate balance this chakra. The BROW CHAKRA’S color is indigo or shades of dark blue. Gemstones like lapis lazuli or sodalite compliment this area. The CROWN CHAKRA’S color is purple, the secondary color is clear or white.Gemstones like amethyst or clear quartz are perfect. The crystals and gemstones in this list are conveniently linked to Amazon for immediate purchase. Agate Balances ying-yang energy, stabilizes the aura. Imparts strength and courage. Opens one to innate creative talents. Amethyst Calming energy. Encourages spirituality and contentment. Stone of stability, strength, and peace. Excellent for meditation. Enhances psychic ability. Aventurine Independence, leadership, creativity. Balances male and female energies. Aligns intellectual, physical, emotional, and etheric bodies. Aquamarine Courage, intellect, protection. Assists spiritual awareness and actualization. Azurite Awakens psychic ability, insight, and intuition. opens the third eye. Excellent for clearing the mind for meditation. Amazonite Balancing energy, harmony, Fosters Universal love. Bloodstone Bloodstone imparts strength, courage, and the self confidence needed to succeed in business and legal affairs. Attracts wealth, sexual potency, insures victory. Calcite Energy amplifier, excellent for clearing and cleansing. Carnelian Carnelian is a healing stone that counteracts feelings of apathy, fear and rage. Fosters peace within and without, imparts self confidence, and inspired verbal and written communication. Celestite Excellent stone for dream recall and astral travel. Chrysocolla Strength and balance. Promotes harmony and attunement to the Earth. Purifies one’s environment. Citrine Dissipates negative energy. Warmth, joy, and optimism. Diamond Purity, perfection, abundance, and inspiration. Emerald Loyalty, sensitivity, harmony, and tranquility. Assists in memory retention and mental clarity. 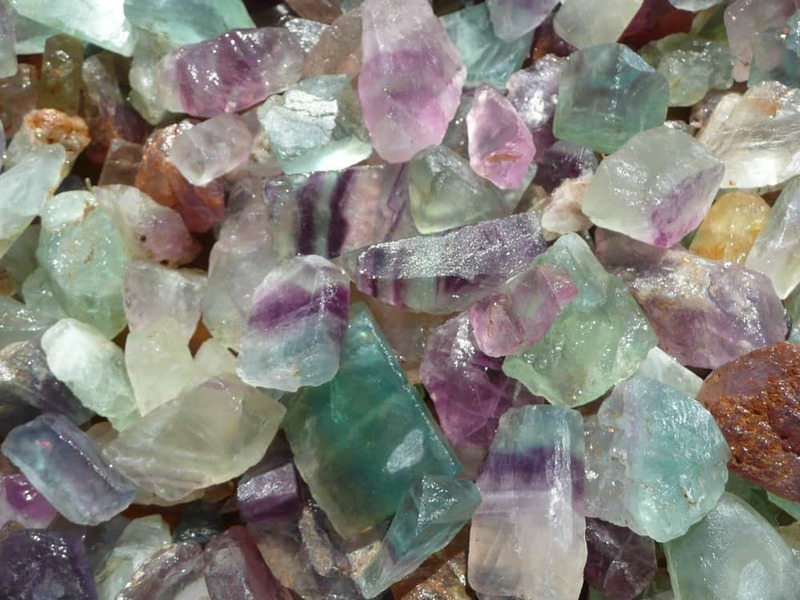 Fluorite Stability, order, discernment, and concentration. Helps one to understand and maintain ideals. Fucite Fosters loyalty, emotional sensitivity, harmony, and tranquility. Assists in memory retention and mental clarity. Attracts balance, abundance and prosperity. Hematite Excellent for the mind, and grounding. Jade Harmony, peace, fidelity, confidence. A great dream stone. Jasper Protection, awareness, insight, and grounding. Kunzite Communication, love and peace. Protects and dissolves negativity. Excellent for meditation. Kyanite Never needs cleaning or clearing, aligns all chakras. Tranquility, communication, and psychic awareness. Excellent for meditation and dream recall. Labradorite Represents the light of the Universe, extra-terrestrial energy. Intuition and illumination. Lapis Lazuli Knowledge, wisdom, perfection, protection, and creative expression. Lodestone Lodestones are natural magnets, and for many centuries, have been used to charge spell items, primarily to attract things to the one using them- good luck, healing, money, love. Malachite Transformation and spiritual development. Clears the way to attain goals. Moldavite Clarity and eternity. Extra-terrestrial and interdimensional access. Moonstone Lunar female energy. Emotional and intuitive. Rhythms, cycles, and destiny. Obsidian Dispels negativity. Grounding, healing, protective. Helps one to clearly see one’s flaws and the changes that are necessary. Onyx Centering, self-control, and intuitive guidance. Assists in the grieving process. Opal Creativity, inspiration, and imagination. Peridot Healing and protective. Allows one to understand changes in one’s life, regulates life cycles. Clear Quartz Crystal Universal crystal, clarity of consciousness….The quartz crystal can be ‘programmed’ to help clear away negative energy from the aura and re-align the chakra energy centers of the body. Rose Quartz Empowers and attracts the energies of love, happiness and peace. Encourages healing on all levels. Ruby Love, nurturing, spirituality, wealth, and protection. Ruby Zoisite Facilitates trance states and a connection to the divine. Good for facilitating communication with angels and Divine Beings. Deepens an understanding of the esoteric and unseen. Rutilated Quartz Intensifies energy. Stimulates the brain. Inspiration and clairvoyance. Shiva Lingam “Crypto Crystalline Quartz”, said to contain the loftiest vibration of all stones on Earth. They emanate a vibration that will purify your temple or home. The stone represents both the male energy of knowledge & the female energy of wisdom. Smoky Quartz Dissolves negativity, grounding, and balancing. Excellent for meditation. Sodalite Logic, efficiency, and truthfulness. Enhances group communication. Topaz Success, true love, individuality, creativity, and joy. Tourmaline Inspiration, understanding, self-confidence, balancing. Tourmalinated Quartz Strength and balancing. Combines attributes of tourmaline and quartz. Turquoise Spiritual attunement, strength, and grounding. Excellent for astral travel. Zircon Virtue, unification, continuity, and purity. Crystals and Gemstones on Amazon and eBay. This entry was posted in Correspondences and tagged crystal healing, crystals, crystals for healing, gemstone, gemstones. Bookmark the permalink.